Ever notice how everyone is drawn to a swivel chair? The ease of getting in and out of it, the comfort and the fun all contribute to its popularity. The Kathleen Swivel Chair brings that comfort, fun and ease wrapped up in an exquisite contemporary design made for the coziest living room scenes. From our Precedent Modern Living Room Collection, DutchCrafters offers contemporary style furniture built with two goals in mind: comfort and quality. 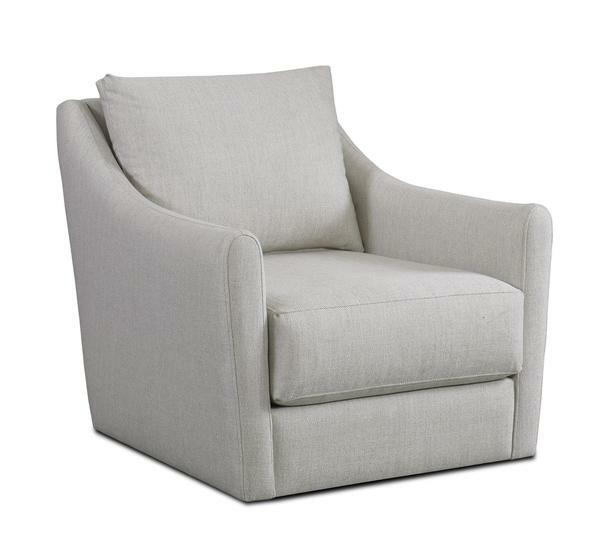 The Kathleen Swivel Chair features beautiful shapes and simple lines, with low chair arms that extend as they curve forward. Extra thick cushioning offers a luxurious seat, making this an accent chair perfect for living room, family room, den or TV rooms. A world of colors and fabrics are available to you with your choice of standard, performance plus or specialty fabric. All performance plus fabrics are treated with Crypton technology. This makes them ultra resistant to stain, odor and wear and they clean up easily when spills do occur. Order samples of our custom fabrics to work with at home. Our friendly team members are here to help. Email or call us with any questions about the Precedent Collection at 866-272-6773.